Looks great. Love the grill. Powerstop pads is is what I used to stop the dusting issue. No problem with dust anymore. What's the range on remote start and does this solution turn the vehicle off once you open the door? 100 ft or so. Same as the distance that the smart key can open the doors. It cuts off when you open the door. That paint looks amazing. What are you doing to that thing? Parked next to it’s bigger bro the LX. Unfortunately I will have to sell the LS and get something with a 3rd row like a gx or another LX. Also contemplating trading the LS in on a GX in the next year or 2. With a solid 400 to daily to and from work, the kid taking over the Tundra my wife is in now, and us needing to get the wife a new vehicle, it wouldn't make good financial sense to keep the LS when a GX could still be that luxurious family-hauler that we need. 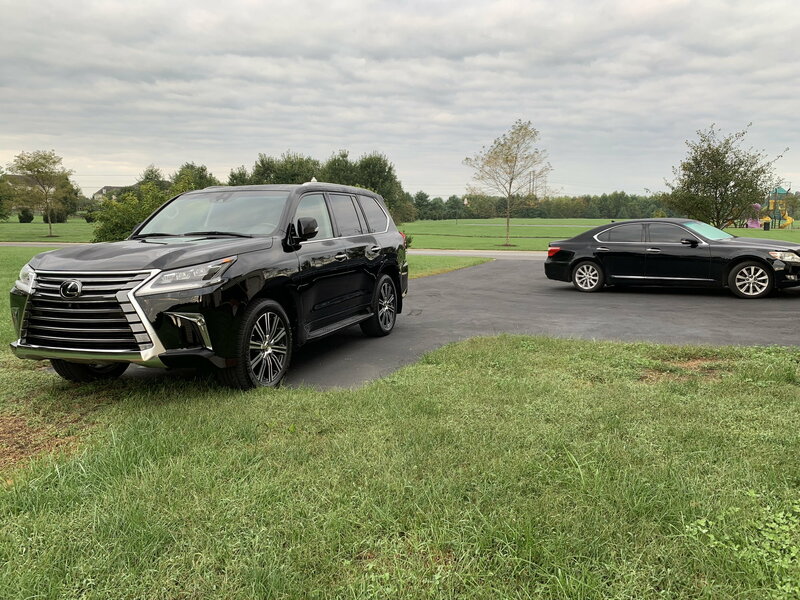 i picked up a GX460 couple of days ago, brand new black on black premium ; the LS rides so much better than the GX; its actually blows away the GX and the LX. Lexus trucks well ride like trucks and they arent really that smooth or quiet like the LS. Oh, I thought the Viper App will allow you to start the car remotely over the cellular network (like Lexus Enform). Do you have to be within 100 feet and line-of-sight for your remote start to work with the App? You are correct, Smart Viper can start start, lock, unlock, panic from anywhere with cell signal. I believe you can also use the remote to start the car (within the remote range). I had it on my wife's old RX 350. We were about to put it on the LS but decided not too. The shop wanted $550 with 3 yr subscription. 2017 SHO. All optioned. So far so good. Fast as &*$#^ and a deal I couldn't refuse. Ok, mine is not as shocking as Roadfrog, but Saturday, I had to buy a new battery. I am going to get one of those trickle chargers cuz I don’t drive the 460 as often as it needs. Anyway, it starts great so no worries for a while.